For Day 27, we’re organizing junk drawers! 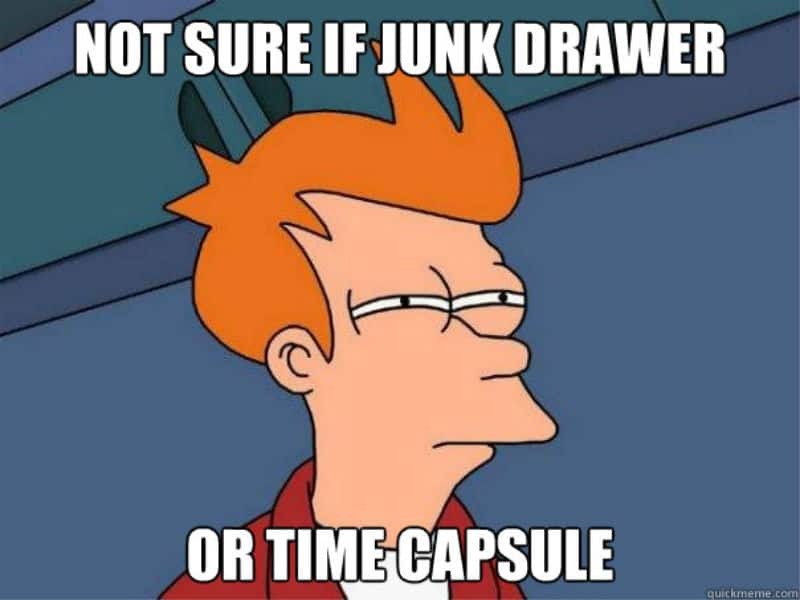 Every home has one, whether you call it the “junk drawer” or the “odds and ends drawer” or some other, more clever name. It’s the drawer where we tend to toss things we haven’t established a permanent place for. But, let’s face it: lno one likes dealing with that catch-all drawer! So, whether you’re just starting the program or you put off organizing the junk drawer on earlier days, today we’re going to ROCK it. Removing clutter is always the first steps in this system. Ordinarily, we do this by focusing on the function of a space and subtracting anything that doesn’t support that function. But “junk drawers” don’t really have a function, do they, aside from holding miscellaneous stuff we either (1) suspect is trash but haven’t yet tossed; or (2) don’t know what to do with. So, removing clutter from a junk drawer requires addressing both of those notions. Throw away anything broken, empty, outdated, or expired. Grab anything that belongs elsewhere and put it away. Don’t just set it aside — if you get tired, you’ll wind up shoving it back into the junk drawer to deal with later. Get rid of the “just in case” stuff — things you kept thinking you’d one day use them or need them, but have not. Organizing junk drawers starts by grouping the pared-down contents into similar items. As you do, you may discover you’ve got quite a few things that are related to each other. If that happens, consider finding them a permanent place in your home that’s not in the junk drawer. Office supplies: binder clips, rubber bands, push pins, pens, and pencils. Spare batteries: these do not belong in your junk drawer and could cause a house fire! Small tools: there’s nothing wrong with keeping a Philips and a flathead screwdriver handy, but you probably don’t need a hammer in your junk drawer. Takeout menus: Most restaurants have their menus available online, so why keep copies at home? You don’t need to rush out and buy interlocking, washable drawer inserts, but they do make a drawer look nice. Check around your home and you’ll probably find inexpensive things that can serve the same purpose. Keep in mind that using lids might make the junk drawer look tidier, but will also make it more difficult to find things. So, skip the lids when possible! Clean your junk drawer while it’s empty. Depending on how dusty your house is, you might want to completely remove the drawer and wipe the bottom and sides of it, too. A damp microfiber cloth is usually sufficient, just be sure the drawer is dry before putting things away. Once you’ve got the junk drawer clean and organized, make a point to review and tidy its contents at least once a month. You may still decide to call it a “Junk Drawer,” but that doesn’t mean you should let it look junky! Keeping things clean after we’ve ROCKed them is an important step in this program. At this point, we’ve worked on every room in our homes and organized our garages, too. Taking a few moments each day to buzz through the house re-setting but not re-cleaning addresses any clutter creep. If you add in the 15-20 minute daily cleaning routine while you do it, your home will always look tidy and clutter-free. We have just three days left in this series, and you don’t want to miss them. In addition to discussing how to organize your car, we’re going to cover a few final tips on identifying clutter and keep it from returning. Plus, I’ll be sharing a printable monthly checklist to help you stay on track! 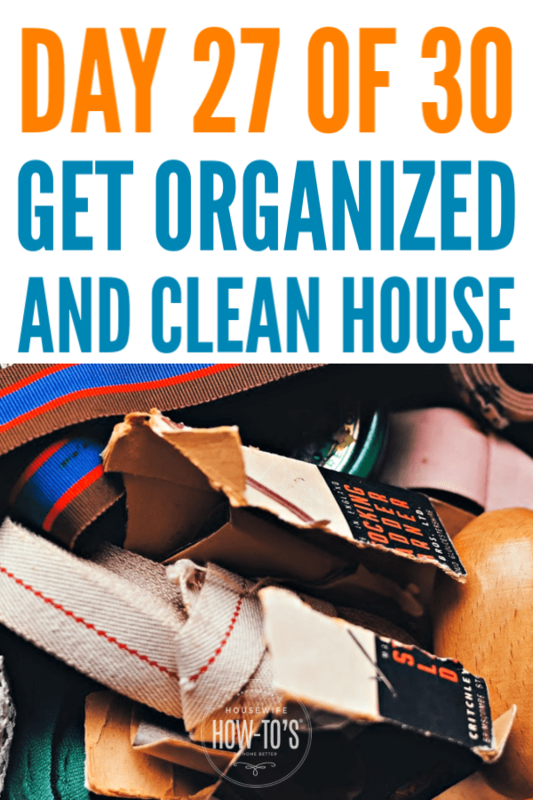 Until then, come join our Do Home Better Group on Facebook and show off your success at organizing junk drawers and other areas of your home. When decluttering I find it very difficult at times to know what to keep and what to get rid of? I get stuck and upset and then can’t continue. What do you suggest I do at these moments. I am not kidding , I often put it off and then feel disappointed in myself. – Is it broken or need more mending than I have time to do that day? – Have I used it in the past year? – Do I have something else just like it that I like better or which works better? – Have I just been moving this from one place in the house to another without actually needing it? – Is it so annoying to clean that I resist using it? – Have my tastes changed, so I don’t like it as much as I once did? – Am I just keeping it because I feel bad about having spent money on it? – Do I know someone else who’d love it more than I do? It sounds strange, but when you first start decluttering you’ll want to ask yourself these questions about every. single. item. It’s kind of like exercising out-of-shape muscles: you start slow, but once you’ve been at it a while you’ll get faster about it. 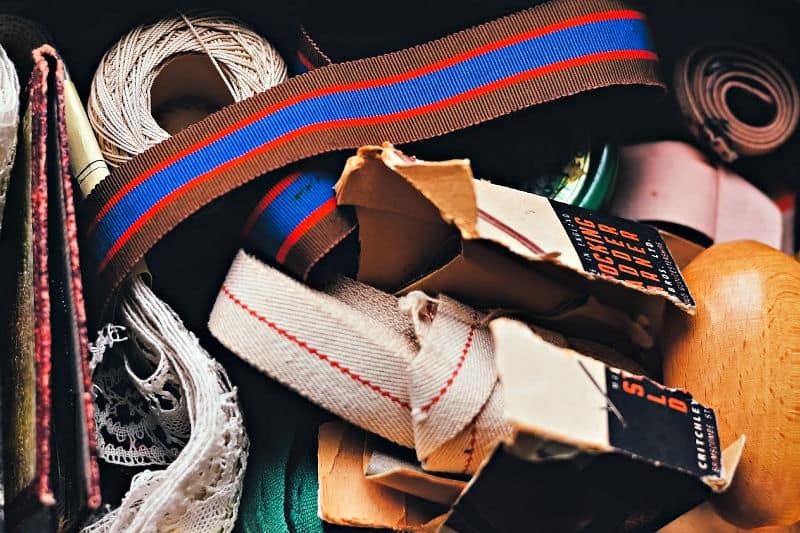 When you’ve been steadily decluttering, you’ll quickly reach the point where you can pick up an item and pretty much make an immediate decision whether to keep, donate, or toss it. The only time I’d encourage holding onto items for a while even if you’ve decided you don’t want them is when you’re decluttering photos, heirlooms, and old letters. If you’re leaning toward tossing those things, put them in a box and set them aside for a season. (Make a note on your calendar to go back and look through them.) After some time has passed, if you’re still leaning toward ditching them then you can feel comfortable that you won’t regret parting with them.